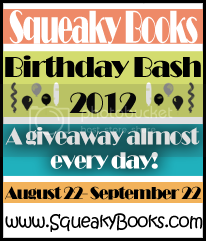 Squeaky Books: Birthday Bash 2012 Starting Line! It's here! It's finally here! After a year of waiting and wishing, it's time for BIRTHDAY BASH 2012! I've created a page that will be home base for the bash. The schedule, as well as links to all of the giveaways and interviews will be posted there. There is also a button that takes you to this page at the top of the blog. Some giveaways are US only, some are international. You can check this page to see which are which. The twitter hashtag for the bash is #SqueakyBirthday2012. You'll get extra entries in the giveaways for tweeting things with this hashtag. There's a button! Here it is! In a lot of the giveaways you'll get extra entries for adding this button to your sidebar. Just copy and paste the HTML in the box below! I think that's all the info you need for now. Again, the first giveaway/interview is TOMORROW! All giveaways will end at 10pm MST on 9/21/12. I started following your blog last Squeaky Birthday, and I can't believe a year has gone by! So stoked!!! Added the button and am geared to go! Who ever said you couldn't have more than one birthDAY a year obviously never met you. An entire month of birthdays! Happy, happy, birthday may all your dreams come true!